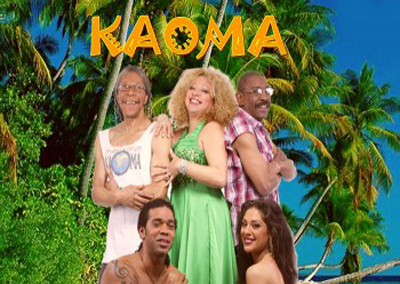 After a sabbatical and return to the roots, Kaoma, composed of the two pillars of the group (Chyco Dru and Jacky Arconte) are reuniting at the end of 2005 to bring back to their fans the intoxicating and festive music. The group is now composed of five artists who complement each other with their different music, songs and dance. Chyco Dru who comes from Martinique, is a rasta man with perpetual, overflowing energy. He is a songwriter, bass player with impressive feeling. He worked with Toure Kunda and a good number of artists from around the world while remainingefficient and cool headed. Jacky Arconte is a composer and extraordinary guitarist from Guadeloupe, born in a family of musicians to whom he does honor. He jumps from recording studios to concerts with the compositions only he has the secret. 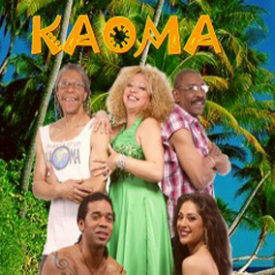 Arconte worked with Toure Kunda, Kassav and many other artists who have enriched the musical world beat. Elisa Daka is a pure fusion of France and Madagascar with ravishing charm. She is a talented dancer and choreographer. Alan Hoy of Chinese and Reunion blood, is a multi faceted singer, songwriter, composer, dancer and actor. This charismatic personality has toured all over Europe as a major guest artist.